I have always been one of those people who runs the risk of not enjoying the moment because I am so busy trying to capture it. As I move through life, I am always alert for tiny events that might one day turn into treasured memories. When the kids were small, I would constantly pull out my camera so that I could try to capture just that one little second. I wanted to preserve each special moment like a perfect drop of amber, to be taken out later and admired in all its beauty. If I didn’t have my camera, I was ready to memorize and immortalize the best times in words. I wrote down the kids’ funny sayings, I kept a journal, I ran an endless sound track of commentary in my head. Now the years have gone by, and the kids have grown and gone. Now is my time to pull out the notes, the journals, the old photos, to see if I really can use them to recapture those fleeting little moments. This past week, I have been scanning old photos and uploading them onto my computer, and into “the cloud”, where I imagine them floating around for eternity, meaningless to the multitudes, but treasures to me and to mine. Some of the pictures are fun to see, because they capture us at different ages and in different stages of development. Some bring back a general memory, and help me to recall a week or a place without giving me back all of the details. Other pictures, though, bring me right back to the exact second when I snapped the shot. Here is one of those pictures, taken in February of 1998. Tim and Grampa, who was always a sucker for a cute kid. When I look at this photo, I am swept right off my feet, and back to the moment. It was a hot day, and we had spent all of it at Busch Gardens in Tampa. My entire huge family was spending the week together in Florida, something that we had never done before, and have not repeated. It was my parents who had arranged and paid for most of the trip; they wanted to have all of the crew around for one special week. It was a blast. On this particular day, about 10 of us had gone to Busch Gardens. My kids were 12, 8 and 6 at the time, and by the end of the day we were all pretty tired. Just before this photo was taken, I had given six year old Tim a “puff” on his asthma inhaler. The heat and dust had taken a toll, and the little guy was tired. He had started to whine, and was asking to be carried. Paul and I just kept encouraging him to keep walking, because we knew that he was fine and was just sort of acting up. And here came Grampa to the rescue. My Dad was the gentlest of souls, and was always ready to soothe and comfort. He was also a real sucker for a cute face, and Tim’s was one of the cutest. I tried to intervene, to tell Grampa that this not-s0-little six year old was perfectly capable of walking, but he would have none of it. Dad reached down, scooped Timmy into his arms and started to walk. I lifted my camera, and my sweet little rascal flashed me this triumphant grin. I am so glad that even in a moment of annoyance at my boy, I was the Mom who wanted to capture the moment. ← No swelled head here! Those are the best kinds of pictures, capturing whatever the moment may be. I have to admit, some photos make me ask, “What were we thinking! ?”, but others, like this one, really make me smile! Makes me want to go look through old pictures. Nice story. Simply lovely. These are such cherished memories. I lost lots of things when Spencer’s Dad and I divorced and photographs were one of them – I know not why. 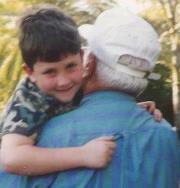 However one of my cherished possessions is a photograph of my son and my grandfather. These memories are so important. I wish, back in the day, ‘the cloud’ had been around – then I could have all those lovely photographs with me. Still, despite that the lovely memories remain. Great post and I am sure your kids will so appreciate you capturing all those memories over the years. I’m so sorry that you lost those photos! But you are so right; what really captures the memories is the way that we have internalized and memorized them. Without my ability to describe and discuss them, I don’t know that they would have any real meaning for the kids. We are the repositories of those family memories, aren’t we? I think, in the end, making memories like that are what makes life worth living. I think so, too! And having the foresight to see those little moments as special enable us to hold onto the memories that we cherish. What did people do before photography? !